Doug Owram, UBC Okanagan’s Deputy Vice Chancellor, and Michelle Rule, Kelowna Councillor, officially opened the new Learning Garden at UBC Okanagan May 31. Water-saving 'xerascape' raised planting boxes are ready. Seeds and bedding plants are in. Now it's up to the sun, the soil, and green-thumbed volunteers to bring forth blooms and bounty to The Learning Garden at UBC Okanagan. Officially opened last Thursday, The Learning Garden has itself sprung like a bloom from the Okanagan grasslands, right beside a picturesque natural pond on the UBC Okanagan campus. The facility was originally designed and built last summer by the first group of Environmental Education students in the Faculty of Education's graduate program. A committee of middle school student teachers have continued that work over the past several weeks. "It's a model school and community garden dedicated to promoting the principles of sustainable environmental practice, responsible stewardship of nature and eco-literate knowledge," said Assistant Professor of Education Veronica Gaylie, Learning Garden coordinator. "This garden is beautiful; its real purpose is to teach and inspire middle school students and teachers how to create their own gardens on their own school grounds." Teachers' garden plans -- curriculum and instructions -- are available to help middle school classes across the Okanagan discover the joys gardening and how to grow their own. Gaylie notes that the Learning Garden also acts as a network hub, connecting schools and teachers to the various resources available. Gaylie thanked the project's many sponsors, led by TD Canada Trust Friends of the Environment, "who allowed us the freedom and creativity needed to make the garden a reality." Sponsors also included Weyerhaeuser Forest Products, Woodstock Lumber Supply, Pier Mac Sand and Gravel, Wood Words Wood Cuts, Art Knapp Garden Centre, West Wind Nursery and Diesel and Dirt. 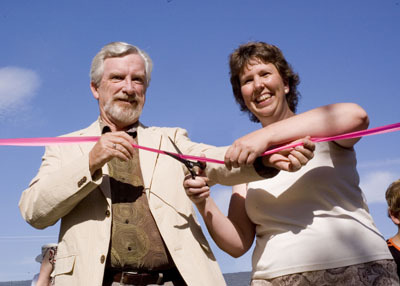 "This garden is the epitome of sustainability and community partnerships," said Kelowna Councillor Michelle Rule, who joined UBC Okanagan Deputy Vice Chancellor Doug Owram in cutting the ribbon to open the garden. She said children should experience getting their hands in the earth, growing, harvesting and enjoying the produce of a garden. "Through this garden, every child will have the opportunity to know what it's like," said Rule. "It really is a gift to the students, the community and youth," Gaylie said. The project's website, with photos, videos and volunteer weblogs can be found at http://learninggarden.blogspot.com/.